After months of harsh talk towards the Democratic People’s Republic of Korea (North Korea), during which he threatened to destroy the country in “fire and fury,” Donald Trump will meet with Kim Jong Un in Singapore. The world is hoping that the meeting will pull us away from the brink of nuclear war. This hope is understandably strong among Koreans, as reflected in a recent statement initiated by a host of Korean American organizations and signed by many other supporters. The statement calls for the denuclearization of the Korean peninsula (link to statement). The strong-armed tactics and bluster from the Trump administration was deflated due to the diplomacy between North and South Korea initiated by South Korean President Moon Jae-in, who was elected partly on the promise to cool down the tension between North and South Korea. Today, polls show that Moon enjoys a popularity rating of 85% in South Korea. The results of the diplomacy became visible to the entire world at the recent Winter Olympics in Seoul, South Korea, as a joint team from the North and the South marched into the stadium carrying a flag representing a unified Korea. The entire stadium of thousands, including dignitaries from the various countries represented, took to their feet in prolonged celebration, demonstrating the desire of the entire world for peace. The only people who remained seated were Vice President Pence and the right-wing president of Japan, Shinzo Abe. It became clear to the Trump administration that the strong-armed tactics were not working, so he changed his tune and started speaking about Kim Jong Un in more friendly terms, claiming that his belligerent threats worked and resulted in better relations. While the Trump administration started speaking in more friendly terms towards North Korea and Kim Jong Un, he appointed Mike Pompeo to the position of Secretary of State and John Bolton as National Security Advisor. Both men have advocated military action against N. Korea in the past. In a recent interview, Bolton called for the Libyan solution for North Korea. Libya was a country that started a nuclear program to deter threats from imperialist powers who wanted their oil and a more subservient government in Libya. Libya agreed to give up its nuclear program on the guarantee that the government would not be continually threatened with regime change. However, the U.S. and NATO did not keep to their side of the agreement. They started bombing Libya and, with the help of mercenaries paid for by Qatar, overthrew the government and created another failed state rife with war, human trafficking, and misery for the Libyan people. Hillary Clinton, during her campaign for president, famously quipped about Libyan president Muammar Qaddafi, who was killed by a pro-western military faction. Clinton said, “We came, we saw, he died” before giving out a maniacal laugh. People, including the corporate media, understood and commented on what Bolton meant by the “Libyan solution” for North Korea: He wanted the same done to North Korea that had been done to Libya. North Korea has already made agreements with the U.S. and its Western allies in the past and has had the experience of seeing the U.S. renege on its agreements. It is also instructive to see how the U.S. recently trashed the non-proliferation treaty with Iran. These examples should give pause to the leadership in North Korea as they meet with Trump in Singapore. In the U.S. corporate media and among politicians from both the Democratic and Republican parties, North Korea is portrayed as a threat to the United States. This is always done when the U.S. wants to build support for regime change wars against governments that are not totally subservient to the dictates of Washington and Wall Street. In such narratives, the truth is never important. By the U.S. government’s false account, we went to war with Iraq because Iraq had weapons of mass destruction and were a threat to us. Of course, Iraqi oil and Hussain’s independent stance had nothing to do with it. So, a war was started that may have been responsible for the deaths of as many as 1.5 million people, caused refugees to flee the war-torn country and inflamed that entire region of the world. The reality today is not that North Korea is a threat to the U.S. but that the U.S. is a threat to North Korea. The U.S. maintains a string of bases in South Korea and keeps a force of close to 30,000 troops in that country. They hold yearly war games right at the North Korean border that have been described as practice invasions of North Korea. During the Korean War, the U.S. led coalition killed a large portion of the population of North Korea and carpet bombed the entire country. They then started bombing the dams, which is illegal by international law during warfare. After the Korean War was fought to a standstill, an armistice was agreed upon to end the fighting. But the North Koreans also wanted a peace treaty to end the war. From then until now, the U.S. has refused to sign a peace treaty, making it clear that their aim is still the same: regime change in North Korea and U.S. dominance in the region. Of course, North Korea is well-aware of what happened in Libya and has seen that when the U.S. was the only country in the world with nuclear bombs, it did not hesitate to use them. In Hiroshima and Nagasaki, the U.S. dropped atomic bombs that in a flash destroyed the lives of hundreds of thousands of people. Today, the U.S. is the main aggressor in the world. While North Korea has never attacked another country, the U.S. does so continuously. The U.S. military is in 172 foreign countries and maintains foreign military bases numbering about 20 times that of all other countries combined. For these reasons, as U.S. antiwar advocates, we do not make demands on the government of North Korea or its people. 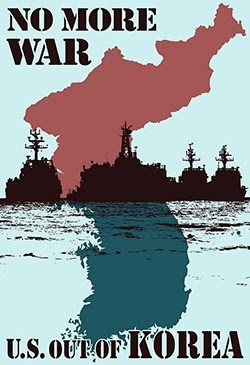 Peaceful reunification and denuclearization, both desirable outcomes, can only come from the democratic desires and actions of the Korean peoples, not by the military imposition of U.S. imperialism. Bring all the U.S. troops home from Korea and all foreign countries! Close the U.S. military base in South Korea and end all military exercises and threats to directed at North Korea! End all Sanctions on North Korea! Ban all nuclear weapons, starting with those from the U.S.! Self-determination for the peoples of North and South Korea!